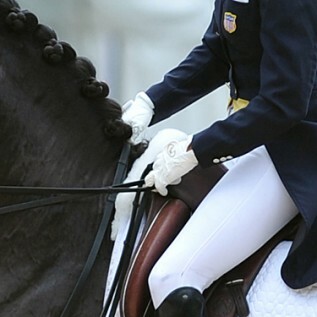 Read all of The Chronicle of the Horse's Dressage coverage of the 2012 Olympic Games. Before this Olympic Games in London, Great Britain had never won a medal in dressage of any color. Now that nation can count not only team gold but also individual thanks to a stupendous performance from Charlotte Dujardin and Valegro in the freestyle today. Last night the British show jumpers celebrated after taking their first team gold medal in sixty years, but tonight the dressage riders one upped that victory by doing something no British team has ever done before: winning team gold. An anticipatory hush fell over the Olympic arena when Charlotte Dujardin entered aboard Valegro. The Olympic rookie carried the weight of her team’s expectations on her shoulders, and her score would determine whether Great Britain stood in first or second after the Grand Prix test. Carl Hester and Laura Bechtolsheimer should’ve been jubilant after the first day of dressage in front of their hometown crowd with Great Britain well into the lead. Pending the approval of the U.S. Equestrian Federation High Performance Working Group and the USEF Executive Commitee, the FEI Nominated Entry for the U.S. dressage team for the 2012 Olympic Games is as follows.